Thanks to Orbit Books/Hachette Audio for my review copy of Wake of Vultures in exchange for an honest review. Wake of Vultures is, in equal parts, a coming-of-age story that delightfully breaks the mold, a western that’ll get you itchin’ to ride a saddle, and a monster story with its own mythos and heart. Nettie Lonesome doesn’t know quite what she is, other than that she’s 100% herself. Her life offers little hope of a future – she’s a half-black, half-Native American girl who is treated like a slave by two people who claim to be her parents. Though she’s a girl, she identifies as a man. Nettie doesn’t want to spend her time knitting or washing clothes – she’d rather be breaking a bronco and working with the cowboys that live their lives in the plains of the Durango territory. Nettie’s life is a whirlwind of mixed identities, and she tries every way she can to break the constraints of a half-blooded slave who thinks she’s a man. Then one day, her opportunity comes in an unlikely fashion. Nettie is attacked by a stranger who looks like a man, but has long fangs and is seemingly unkillable. That is, until in a last-ditch effort Nettie drives a stick into his heart and he dissolves into sand. Now granted with the ability to see the monsters lurking around her, Nettie’s life can never go back to being what it once was. First off, it’s a credit to Lila Bowen’s writing that she can pull of such an atypical, conflicted character in a relatively short book. I love character-driven fantasy and Nettie’s role in Wake of Vultures fits the bill. As hard as writing a half-black, half-Native American girl who identifies as a boy sounds, Lila Bowen makes it look easy. Nettie is a delightful character to read. The fantasy of Wake of Vultures is really cool. At first I was reminded of American Gods (hidden myths in plain sight!) 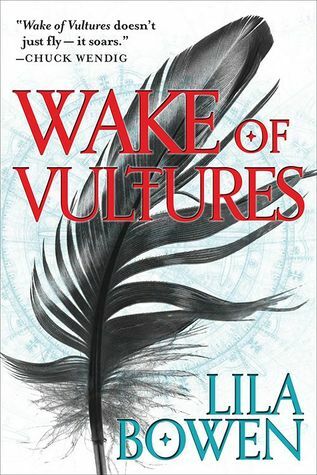 but Wake of Vultures does live and work by its own rules and didn’t feel derivative once I got into the story. Also, I lovedthe Coyotes (no spoilers). Where I feel that Wake of Vultures fell short was some of the story and pacing. At times I felt like Nettie and her companions were wandering around the desert, because much of the time they were. I didn’t mind it terribly much because I enjoy the Durango territory, the Rangers, and several other plot elements. But a few storylines did feel a bit open-and-shut, a little too episodic for me. One final note – Lila Bowen’s writing is superb. She nails character voice for Nettie and does a good job of establishing an appropriately Western tone for the story without hitting the reader over the head with tumbleweed references. Read Wake of Vultures if you’re into unique character perspectives, Western settings, and monster stories. Thanks! Glad to hear it. Looking forward to continuing it! This one has been sitting on my shelf for a couple years. I really need to pick this one up (it will be my first Delilah Dawson). For sure! Phasma was my first, and even though I didn’t “love” it, I’d been wanting to get into this series. Also interested in her new series with Kevin Hearne.